Debbie Lesko has always been a few bricks short of a full load. She gets elected only because she has run from a “safe” Republican voter registration district where GOP tribalism means voters would vote for a cardboard cutout of a cartoon character if it had an “R” behind its name on the ballot. This is why we cannot have nice things in Arizona. Apparently the candidate interviews with the editorial board of The Arizona Republic did not go well for Debbie Lesko. Her opponent, Dr. Hiral Tipirneni, stood head and shoulders above her. The difference between the two is, in fact, startling – from their outlook on who they represent to their work histories. (Tipirneni spent 10 years as an emergency room doctor, Lesko spent nine years as a state legislator). One of them has actual ideas to fix some of our most vexing issues and the other? Not. A. Clue. Did I say their differences were startling? Actually, more like shocking, which possibly explains Tipirneni’s better-than-expected showing in a special election earlier this year to fill the seat vacated by Trent Franks. Reporters and editors at The Republic recently sat down with the pair to talk issues. Lesko says she supports President Donald Trump’s wall and notes that Tipirneni is against it. Tipirneni says she’s not against spending money for a wall where it makes sense. She says the Border Patrol is 30 percent short staffed and needs better surveillance equipment, drug sniffing dogs and x-ray equipment, given that most drugs now come through ports of entry. Tipirneni says she supports several pillars of the Affordable Care Act, including the individual mandate, no lifetime cap on benefits, allowing children to stay on their parents’ plans until age 26 and protecting those who have pre-existing conditions from being locked out of insurance. For those who don’t qualify for a healthcare subsidy but don’t have access to an employer-based plan, she proposes that they be allowed to buy into Medicare. Lesko says she also supports protecting those with pre-existing conditions and allowing children to remain on their parents’ insurance until they are 26. 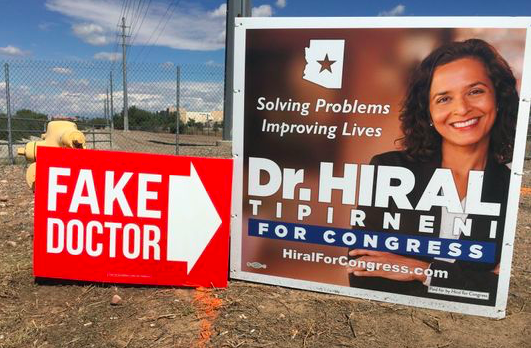 She objects to Tipirneni’s Medicare buy-in plan, calling it government-run health care. She would expand health-savings accounts and allow people to buy insurance across state lines and beyond that, doesn’t offer any plan. The Social Security trustees report, released earlier this year, projects that the combined trust funds for retirement and disability will be depleted in 2034..
Tipirneni says we face a tough set of choices: either raise the retirement age or impose new taxes to keep the system solvent. She opposes raising the retirement age and instead supports “slight bumps” in the payroll tax and the amount of earned income that can be taxed for Social Security. Lesko said we should cut down on fraud and grow the economy and beyond that didn’t offer any proposal to shore up Social Security. She says she opposes tax increases and doesn’t know if she would raise the retirement age. Lesko will do whatever the GOP House Freedom Caucus tells her to do. Thinking is hard. 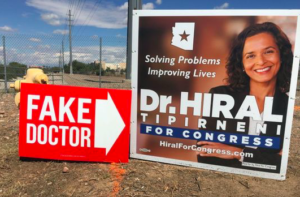 This interview fail follows a recent scandal in which the Lesko campaign went full Roger Stone GOP ratfucking dirty tricks by posting “fake doctor” signs next to Dr. Tipirneni’s campaign signs. 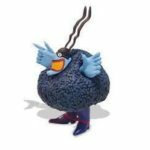 Ethics smethics! The Lesko campaign has since agreed to take down the false signs, only after getting caught red-handed. [T]he incumbent and her party must be spooked by the support Dr. Tipirneni has been receiving; otherwise, why the sleazy campaign antics? You know a politician is having a bad day when she gets blasted by a political action committee that … endorsed her? Welcome to the world of Republican Rep. Debbie Lesko. The physicians that make up the Arizona Medical Political Action Committee (ARMPAC) on Saturday diagnosed Lesko as a sleaze. While no longer seeing patients, Tipirneni has a medical degree and maintains a license. 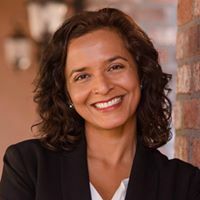 We conveyed to the Lesko team ArMPAC’s (Arizona Medical Political Action Committee) position that despite the fact that Dr. Tipirneni is not currently treating patients, it does not make her any less of a real doctor of medicine. Lesko, in turn, agreed to take down the falsely worded campaign signs. It’s a little late, of course, like giving someone a vaccine after they’ve already got the flu. Then again, in politics there is no inoculation for dishonesty. C’mon CD 8 voters! You have a clear choice of a far superior candidate to represent you in Congress. Put aside the mindless GOP tribalism and vote for the more qualified and superior candidate. Don’t you deserve better than the dimwitted and unethical Debbie Lesko?